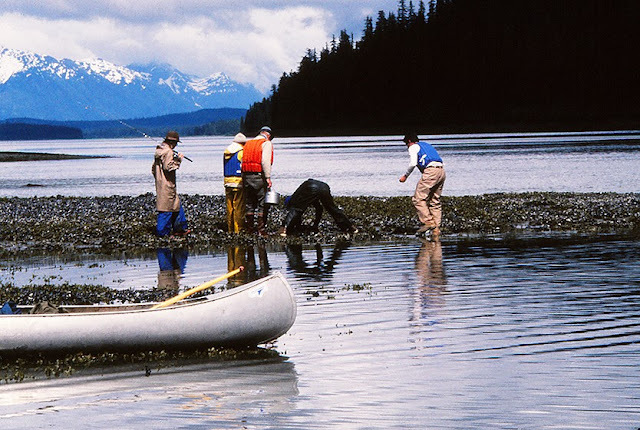 THE TONGASS, #137: Our guided Alaska Discovery group, assembled for a 10-day canoe traverse of the Seymour Canal and Admiralty Island lake system is an interesting mix. Philip, Carey, and I, have joined men and women of the Sierra Club for this adventure, and I am struck by how many of them are older, old enough in my mind, that this trip will prove difficult for them. I am expecting the next 10-days to be QUITE challenging. This morning, however, we are just getting used to each other, and how we work together in our canoes,..or not! The canoes are stashed with a lot of gear and food, then once everyone is aboard, they are heavy in the water. That makes paddling more tiring, and any out-of-sync strokes will most likely create an “s-canoe” by momentum. An “s-canoe” is what happens when the paddlers cannot keep the canoe in a straight line. There is A LOT of that! At first, it is funny. Then, it is just tiring. In fact, there are times when it seems no one wants to paddle at all (above - LOL!). BUT, paddle we must. The day is young, and we have miles to go before we sleep. THE TONGASS, #136: From one floating conveyance to another - following our kayak camping trip into Misty Fjords National Monument, Philip Slagter and I, return to Ketchikan, pack our gear for the next travel, and have a departure dinner party with some of the friends we have made while based there. We depart for Juneau the next morning, where my wife, Carey, awaits us. We are about to do an epic, guided Alaskan adventure. I have been advised to contact Ken Leghorn, who has founded a guide group called Alaska Discovery. I am told, Ken will teach us much about the Tongass, and how to enjoy exploring it, and to do so, he has placed us on a 10-person, 60-mile, canoe traverse of the Seymour Canal, the lake system of Admiralty Island, and Mitchell Cove, ending at the Native village of Angoon. Time in Juneau is spent getting and checking gear, and connecting with AD. As we have not yet seen a bear, Philip has been increasingly anxious about this trip because Admiralty has the greatest concentration of grizzlies in the world. His first question to Ken is to ask if we will see one, which Ken thinks is likely. Philip then asks if he can go in on the first flight with Ken, to get over his apprehension. That is fine with all of us, so the next morning, Ken and Philip are the first out, carrying a lot of supplies. The canoes we will be using first, are stashed in the forest at the north end of the Seymour canal. To find their stash spot, the pilot flies the length of the canal, and as they approach the location, the roar of the plane engine draws a curious bear out of the forest, RIGHT WHERE THE CANOES ARE SHELTERED. That pretty much answers Philip’s question. The bear continues down the beach. Ken and Philip go ashore to drag out the canoes, and the rest of us are delivered by successive flights. 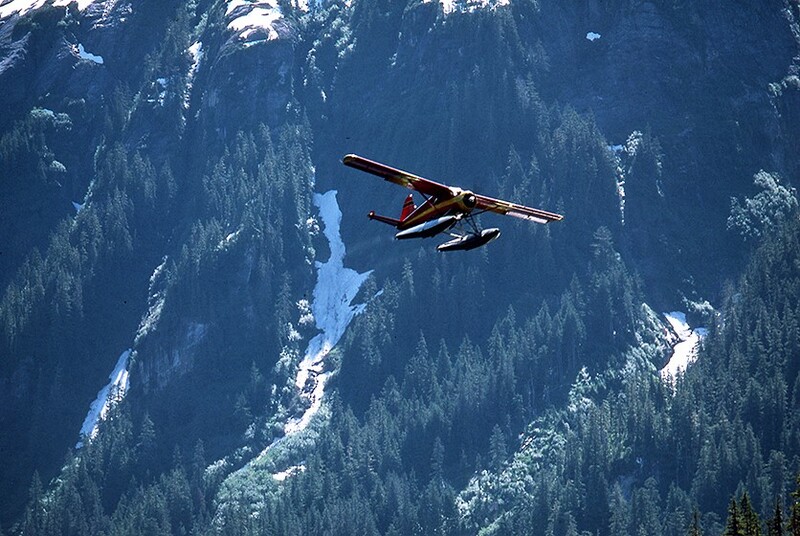 The image above, is the Alaskan “moment of truth” - the plane or boat that delivers you, leaves. It is raining (surprise, surprise). We load the canoes, and start a long, multi-day paddle, down-canal, to a location called Mole Harbor. THE TONGASS, #135: Philip Slagter and I are leisurely paddling our kayaks towards the mouth of Rudyerd Bay, where we expect to be picked up by a boat and taken back to Ketchikan, following our several days of camping in the fjord. There is a stiff breeze blowing right at us, and we find there is some protection from it by paddling close to the towering walls. With still some hours to go before our boat is due, he and I can hear the sound of a motor for the second time today, only this time it is not a cruise ship (post #132), it is an airplane. 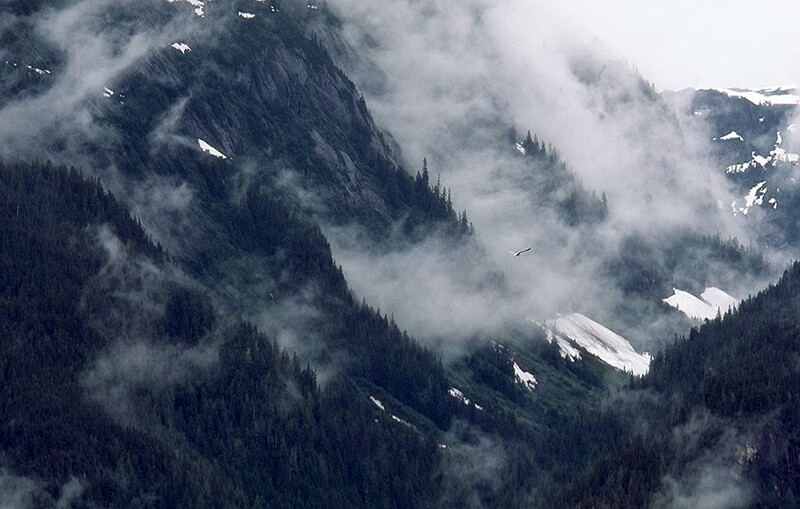 We can hear it long before we see it, but it is most likely a flight-seeing group out of Ketchikan, visiting Misty Fjords. As it comes into view and flies down the center of the fjord, it eventually passes above us. The flight path then goes down to the junction of arms, near where we camped, and turns back toward us, beginning what appears to be a descent path for a water landing, eventually touching down when it is parallel to us. Philip and I figure the tourists want to take pictures, perhaps of us. Surprisingly, the plane shuts down, the doors open, and the passengers step onto the plane float that faces towards us. They are a long way out in the middle of this huge bay, and it is hard to see more clearly what they are doing, but they have our attention. In fact, they start calling to us, motioning us to come over. 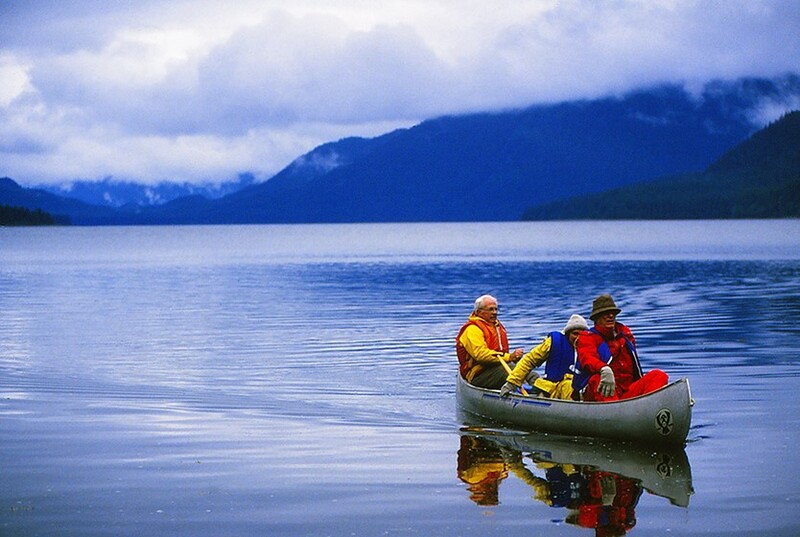 It seems weird, but what the hey, it’s Alaska, so we start paddling. When we get closer, we realize everyone is wearing a mask, and is dressed in long, trench coats. One of them throws a floating object in the water with balloons tied to it. We are clearly puzzled and draw closer slowly, when suddenly - the reveal - as it turns out, these are women we know from Ketchikan, and in one synchronous moment, they all open their coats to reveal lingerie or bikinis. Two of them drop their pants and moon us. There is a little salacious dancing, then they tell us the float has survival supplies in it, jump back into the plane, and take off. Bewildered and amused, we retrieve the floating supplies: Candy bars, cannabis, condoms, several pair of women’s underwear, and instructions about where to appear for dinner, once we are back in town. A short time later, our boat picks us up, and some hours later, we do join a very fun dinner party. 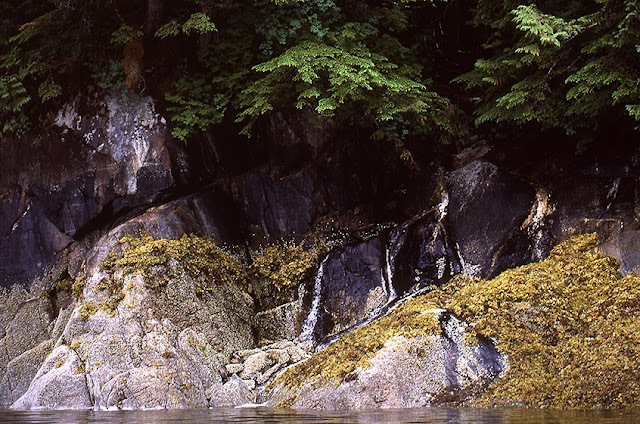 THE TONGASS, #134: After paddling along the base of one of the most verdant wall sections in Rudyerd Bay - an astounding visual - I want to see the bigger picture, so in spite of the wind blowing into the fjord, I leave Philip and paddle out to attempt a more encompassing POV. Philip and I have been riding on an outgoing tide, and in picture-left, at the bottom, you can see the dark band in the rock that marks the high tide line. Kelp is visible below that now because the tide has been dropping during our several hours of paddling. 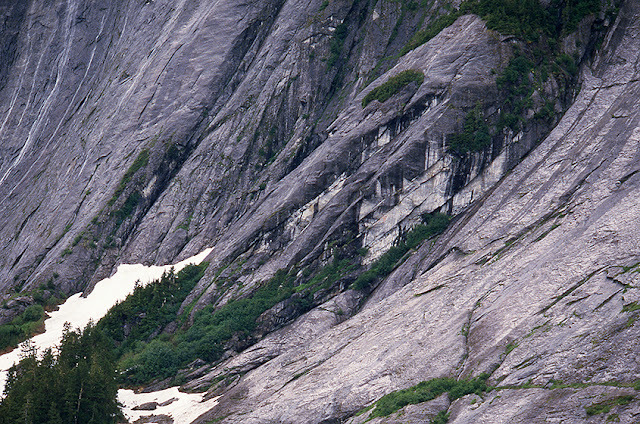 The wall here is truly sheer, glacially carved, fjord, probably 1,500+ft. vertical. Yosemite-like, were it not for the astounding opulence of vegetation. It has become a part of architectural fashion these days (2019) to create “living” walls for houses and corporate buildings, but this is my first encounter with that idea 35yrs. earlier. To get these shots, I change lenses, which means I am NOT paddling, so I am losing ground rapidly, and my kayak is rotating around as I am trying to shoot. There is no “holding” my position. It is actually exhausting (and cold), so after a few frames, I rejoin Philip along our reasonable shelter at the base of the wall. We have a few more miles to paddle, and hours to expected boat pick-up, so we leisurely continue our traverse. 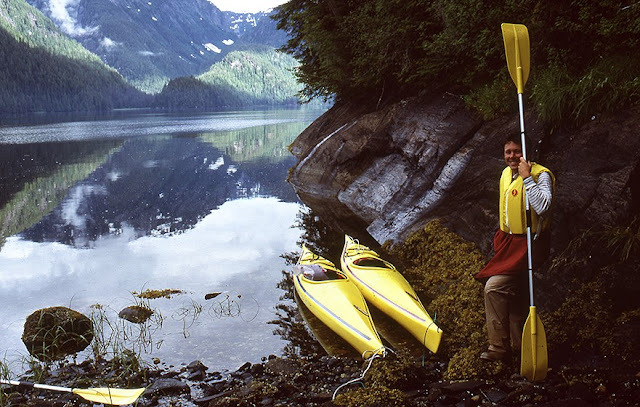 THE TONGASS, #133: While we are riding an outgoing tide in Rudyerd Bay, Philip Slagter and I, are paddling into a growing “breeze.” Knowing nothing about kayaks at the start of this trip, the ones we have are loaned to us. 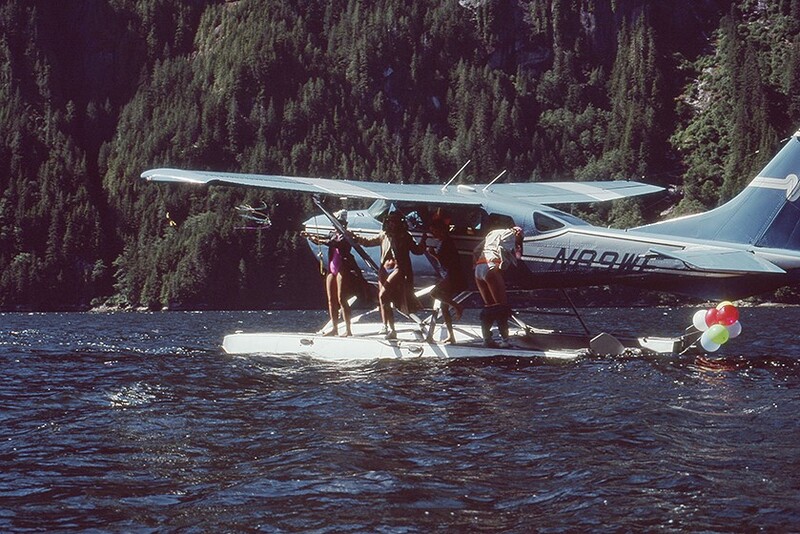 They are inexpensive, one-piece, cast plastic shells, intended for limited tourist use, and they do NOT have rudders. As a consequence, we get constantly blown from one side to another, and it is hard to keep your kayak tracking in a straight line, unless you are right up against the vertical walls. Furthermore, if you stop paddling for any length of time, you are blown backward and turned sideways. In that position, a gust could be a dangerous thing, and roll you. Phil and I enjoy the amazing walls, however, so we have no problem hugging them closely, even when they occasionally drip on us. 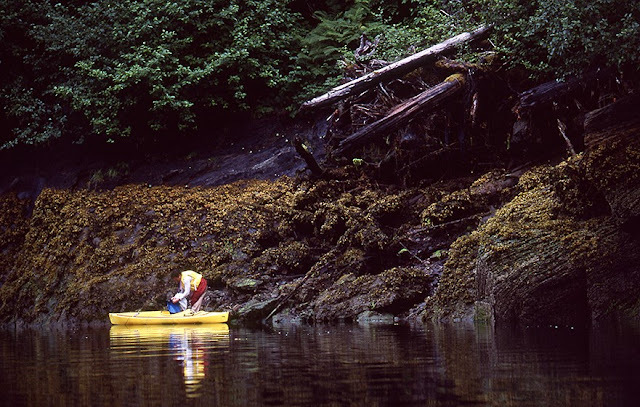 We are paddling along the southern walls of Rudyerd Bay, and they are in shade most of the year, so they are layered with mosses, and trees grow out of every crack. Scale is difficult to read this close to the wall, but I can assure you that this is a SUBSTANTIAL overhanging slab. THE TONGASS, #132: It is good we go to sleep early the last night before we are to be picked up down-fjord by a boat, because we are awakened early by an entirely different kind of boat. Well before dawn, the summer Alaskan sky is bright, so about 5:30am, Slagter and I are half asleep, and we can hear a loud engine AND loudspeaker voices, talking about the fjord and the “garden walls.” It seems, whatever it is, is also coming closer to us, so in our capilene long-johns, we crawl out of our sleeping bags, and tent. Before us, at the widest juncture of Rudyerd Bay and its arms, is a full-blown cruise ship. There are hundreds of people lining the rails of decks and balconies, and they are being given a lecture on the boat-wide PA-system - so considerate! Our beach is dark rock, with dark trees, but our kayaks are banana yellow, and we are in white-with-stripes Patagonia underwear. As we stand at our shoreline, rather startled, we suddenly hear the PA-voice say, “If you will look carefully with your binoculars, over against that cliff are some kayakers that must be camping.” With that, in perfect Phil-fashion, he goes to the tent, brings out the rifle (unloaded), joins me back at the beach, and we wave to all who are looking. The PA broadcast ends, and the ship turns around by doing a 360˙ with its thrusters, retreating back down the bay. Not much later, the sun rises on a clear day, so we breakfast, break camp, and are excited to paddle once again along the amazing walls of Rudyerd. The tide is dropping, so we are riding with it, and several hours and miles from now, we should encounter our pick-up boat. 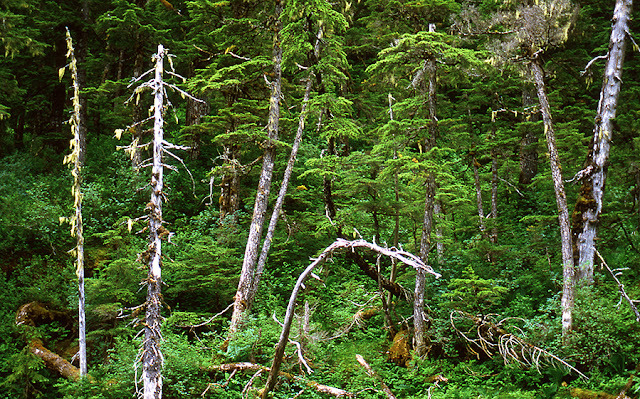 THE TONGASS, #131: It is not much farther to the terminus of the north arm of Rudyerd Bay, from the slot canyon river we explore (last two posts), and it is good to finally arrive, as we have been in our kayaks for several hours and we need to stretch, and walk around a bit. At the end of the arm, a large river flows in, and it has created a sizable sand and log debris delta. We have a good line-of-sight, because the beach and meadows are flat for some unobstructed distance before entering the forest, and if a bear were to approach, we would see it coming. For sure there are bear here! Appropriately, before we settle in to have some lunch, Philip gets the rifle out of the kayak, so it is more easily at-hand. The rain has stopped, the insects are minimal, and a large gathering of gulls bathes and gossips not far from us. The paddle has been longer than we expected, and we are tired, but eating refuels us, and the tide shifts to outgoing, so that will help us as we can “ride it” back to our campsite. Even so, it is nearly dark before we are “home.” We are due to be picked up the next day, so in waning light, we eat a good dinner and pass out early. 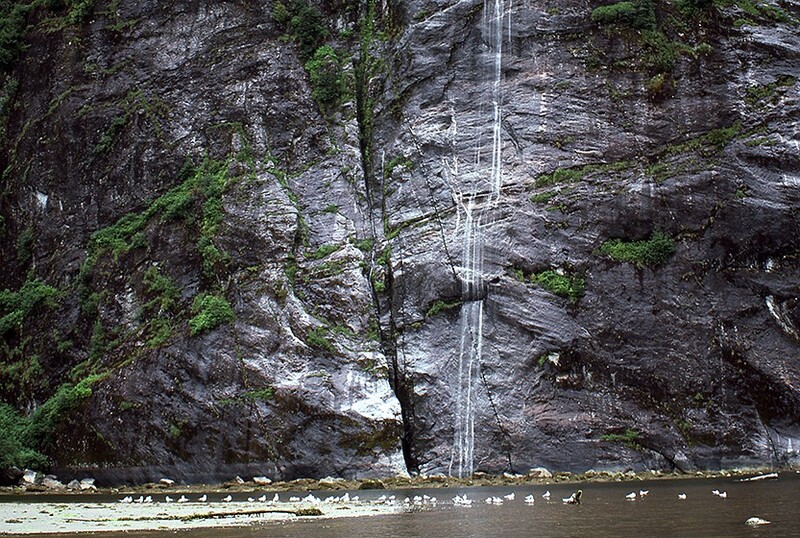 THE TONGASS, #130: Philip Slagter and I have nearly reached the terminus beach of the north arm of Rudyerd Bay, but before arriving there, our shoreline exploration reveals a considerable river, flowing out of a sheer cleft in the fjord walls, and we paddle up it “to see what we can see.” The granite towers 2,000 absolutely vertical feet above us, making the slot canyon quite dark, but lushly overgrown with ferns and Devil’s Club. Most of our paddle has been in deep water, then we finally come to a sandbar. We can cross over easily in our kayaks, but as we are pondering whether to do so or not, two big salmon riffle the water, crossing over the bar, as they swim upstream to spawn. Our first thought is that seeing salmon is cool. However, another thought dawns on both of us very quickly. If there are salmon in the stream, there are bears in the forest, who fish the stream. Philip then points out that the shore on either side is quite close, and that the rifle we have is in the hull of the kayak. It would take some effort to get it out, without getting out of the kayak first. On that note, I also realize that the river has narrowed to the point we cannot turn around, so if we are to extricate ourselves from here, we will have to paddle backwards,..a task we begin to do IMMEDIATELY! At the first widening that will allow us to rotate our boats, we do, and before we paddle back out into the greater fjord, I catch this one last shot. I think the look on Philip’s face says it all - LOL! THE TONGASS, #129: During our leisurely paddle into the north arm of Rudyerd Bay, Philip Slagter and I see many spectacular waterfalls, and explore the vertical shore that is often deeply cleaved by flowing streams. 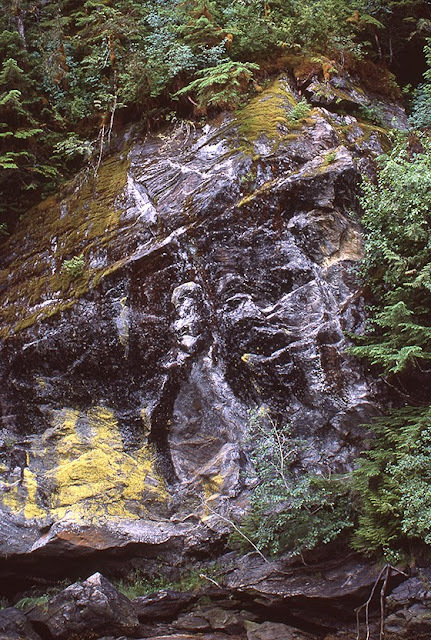 Near the terminus of the arm, however, something MUCH larger than a cleft stream appears. 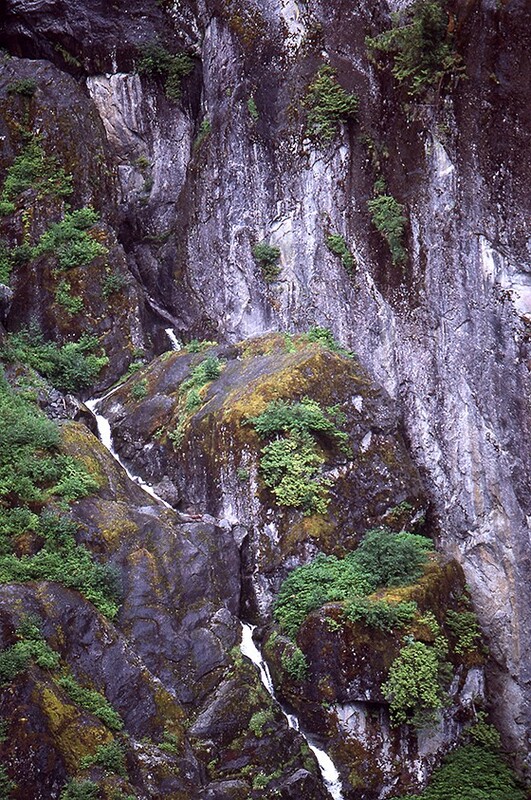 This is an absolutely vertical canyon on both sides, with a true river of water flowing out of it. It is so narrow, I am sure sunlight rarely touches the forest floor, and since it has been raining on-and-off for several days, the walls glisten and stream with water, and the river is bordered by dense, verdant, and very entwined trees, snags, ferns, and Devil’s Club. It is quite dark, but strangely beautiful, and Philip and I realize we can paddle up it some distance, so we do. At first it just seems that we have found a kind of “lost world,” but as we progress, the river narrows even further, and the growth onshore, begins to overhang the river, making it ever darker. To this point, the river has been relatively deep, but just ahead of us, we can see it grows more shallow as the water passes over a sandbar. These kayaks we are using do not have rudders, and they are extremely light and buoyant, when they are not loaded with gear, so we could float over the bar easily. While considering whether to do so or not, something else occurs that gives us pause for thought,..2 large salmon splash up big riffles in the water, as they pass over the bar, swimming upstream to spawn. THE TONGASS, #128: Paddling on, up the north arm of Rudyerd Bay, Philip I discover a spectacular array of waterfalls. In the narrowing fjord. They are all around us, and we can always hear water noise as glide along. The tide has been incoming this morning, so we are riding it, as it floods into the end of the fjord. We are hoping to reach the terminus of this arm before the tide shifts to flow out. It seems like that might be a good place to eat, and rest, before the tide turns, and then we can ride the outgoing flow, back toward our campsite. Besides the myriad waterfalls, there are also numerous streams that flow in through some VERY deep clefts in the fjord walls. These are true streams, often running through some narrow, tree-stump-choked slots that dive deeply back into a separation in the vertical rockl. Most of these are interesting to peer into, but offer no navigable way into them,..well, except for one we find that is considerably larger than the rest. THE TONGASS, #127: It rains hard on-and-off during the night, but we have a great pitch and a great tent, so we are warm, dry, and we do not have any bears visit us. As we start breakfast, the clouds lift, and we get some fleeting sunlight here and there, as they drift pass. Excited that we may have a reasonably nice day with a minimal amount of rain, Philip and I scarf down our breakfast, load up our daypacks with food, squeeze back into the boats, and head out to explore the north arm of Rudyerd Bay. Some hours roll by, as we are in no hurry to be anywhere. We are just kayak sightseeing. The further into the arm we go, however, the narrower the fjord becomes, and it seems the walls around us grow even higher. As you can see in the shot, Philip is approaching a bend that is littered with the log debris of massive trees. It must have been some kind of flooding circumstance to do this. We are now surrounded by a deepening forest, and much more of a shoreline with embankments and meadows. This IS definitely bear country. The pilot of the boat that brought us here, also gave us a rifle for protection, and Philip has that in his kayak. I am not sure we intend to get out of our kayaks and walk around, but if we do, at least we will have some defense. THE TONGASS, #126: The small beach and forest terrace Philip and I have discovered, finally offer us a place suitable to set up a camp. Our tent is well above the high tide line, and there are numerous, small freshwater streams coming down through the cracks in the rock wall to provide water. As a bonus, except for the small patch of flat land we have found, the walls rise sheerly beyond the screen of trees, and make an unexpected approach by a bear, virtually impossible. Once out of the kayaks, we get camp squared away, and set up for the night. We have been in the kayaks most of the day, and it feels good to be out of them and moving around. 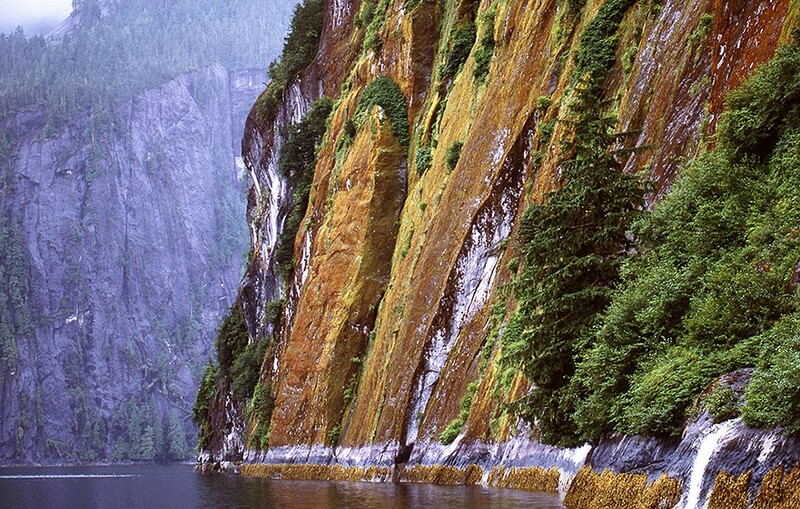 Rainy weather rolls through periodically, and the fjord walls around us put on a show. As we study our map of the Rudyerd Bay pondering what we might do tomorrow, we can see that the north arm runs more deeply into the fjord, and we have not paddled any part of that, as yet, so as we eat and settle as night falls. It is our plan to paddle that north arm in the morning. 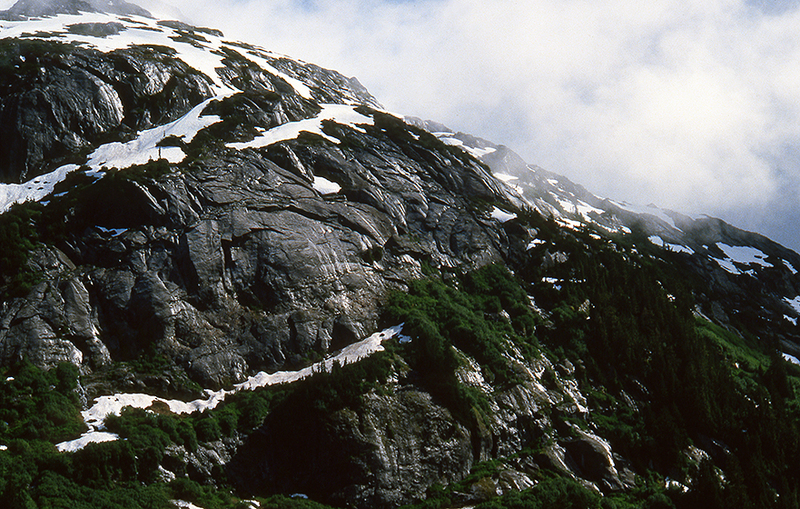 THE TONGASS, #125: Nearing its terminus, Rudyerd Bay splits into two arms, running roughly north and south. Philip Slagter and I have paddled most of the main fjord’s southern wall, and then rounded the bend, into the southern arm, the less lengthy of the two. In search of a campsite, we carefully explore every possibility, but nothing is forthcoming. Having circumnavigated the entire southern arm, our paddle brings us to a point where we can once again see the juncture of the main fjord. 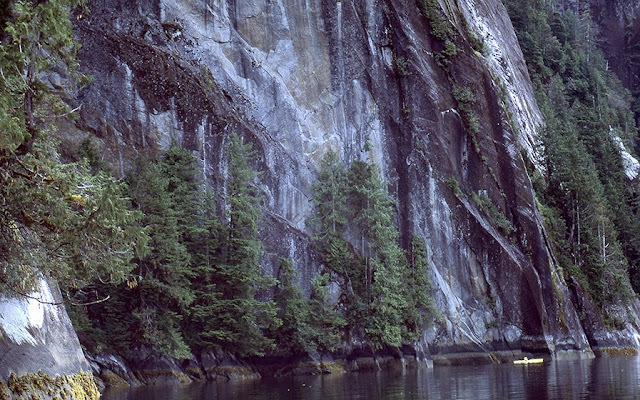 We are close to the rock ledges of the eastern shore as we pass around a small point, covered by dense trees. On the other side of the point, there is a little cove with a gradual, sloping beach that runs up into the trees. In the lowering tide, there is exposed seaweed and mossy rocks, but they are on a relatively flat, graveled “beach,” and there is no doubt we can ground the boats and get out in safety, so we do. We can see freshwater available in numerous places, so the question that remains is, does the forest offer any open floor, or are the trees too close together to squeeze a tent in? While Philip holds the boats, I walk up the grade of rocks and push through the first trees,..where I find an open floor behind a screen of trees, and no evidence of tidal inundation or bear poop. We are home! 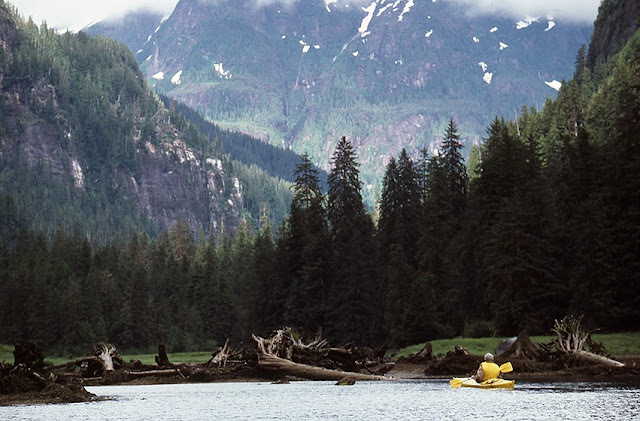 THE TONGASS, #124: After his pit stop, Philip carefully slides back into his kayak without rolling it, and once again we start a slow paddle, searching for a campsite. There is freshwater everywhere, there just are no beaches or accessible flat ledges. The stunning vertical walls are a spectacle of rainforest extravagance. 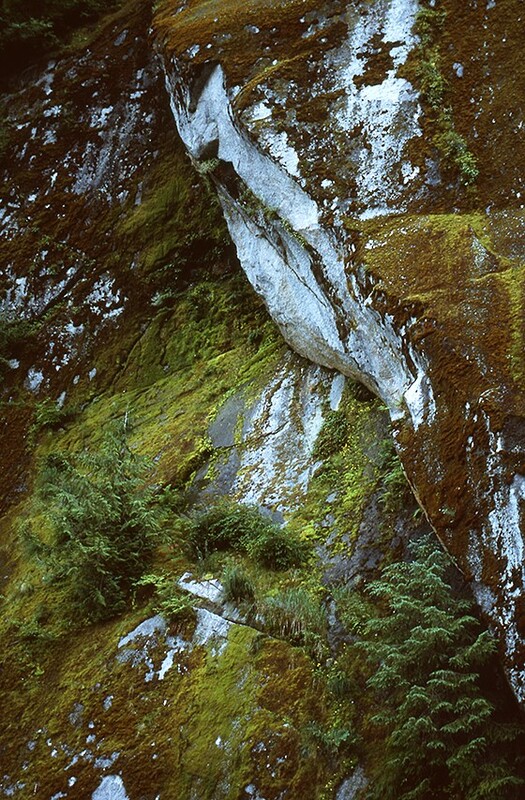 Lush mosses and lichens drip off of rocks, and dense brush and large trees grow directly out of the rock. I am not sure how that happens, but it is an amazing thing to behold, especially when you are looking up at it towering above you for thousands of feet. All that being said, these dramatic walls are not helpful to our search for a flat spot above the tideline, that is also accessible. We explore the entire shore of the southern arm of Rudyerd Bay, and find nothing. The north arm is much deeper, and we were hoping that we would not have to paddle it today, but as yet, there is no place for us here. THE TONGASS, #123: My colleague, and fellow artist, Philip Slagter , and I have been paddling our kayaks into Rudyerd Bay fjord for several hours now, in hopes of finding a location that would support a campsite. The towering vertical walls have yet to even offer a ledge, and worse, as the tide is dropping 18+ feet, extremely slippery, seaweed covered rocks have emerged that make any thought of ascending the wall, a stupidly dangerous thing to consider. As I have noted, the walls are so sheer, and vegetated, there has not been one place to even try to get out of our kayaks. Unfortunately, now that several hours of paddling have gone by, Philip needs to pee, and there is no simple place to do that. Finally, about half of the way around the cove of the fjord’s southern arm, the tide has exposed some large rocks flat enough for Philip to stand upon. Even so, as I watched this, extracting yourself from a kayak onto a slick surface surrounded by freezing cold water, looked tricky to say the least, and then he had to get back in. After that, we both agree that any campsite MUST have a non-threatening access point. There is no chance we can unload these boats and move bags of gear around, under the circumstances he just experienced. THE TONGASS, #122: Philip Slagter and I continue our kayak paddle into the southern terminal arm of Rudyerd Bay, hoping to find a usable campsite. The tidal outflow in the arm is less extreme which makes our paddling easier, but the wall we are presently next to, is even more congested and unscalable then those we saw previously. It is beautiful to look at, and the increasing amount of vegetation makes for some dramatic ledges, and dark, drippy coves, but nothing offers us a place to establish a camp above the high tideline. In fact, we have not yet seen a place where we could even access a point above the high tideline, the walls are so steep and slippery. This is our first fjord camping, and it is less inviting than we might have hoped. 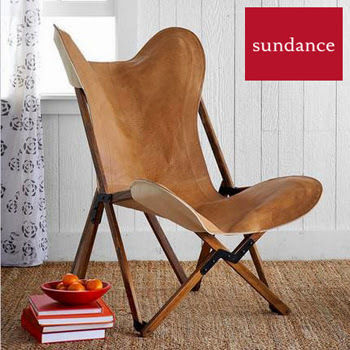 Methodically, however, we carefully follow the shoreline, and inspect every possibility. Of course, it would be nice if we could find a site, but it would be even better if we could find one near a freshwater stream. At least these walls have plenty of those. THE TONGASS, #121: As Philip Slagter and I paddle our kayaks into Rudyerd Bay, part of Misty Fjords National Monument, we are astounded by the lush sheer walls and the massive 18ft+ tidal exchange, but we are also concerned because we have found no possible places to camp. As Rudyerd Bay terminates, it divides into two arms, and we make a right turn into the shorter one, continuing to paddle close to the wall in hopes of finding a workable site to pitch a tent, or even get up the wall. The turn into the shorter arm brings us into a different world. Where we presently are, the sheer walls are still massive, but with much greater vegetation density. As the arm reaches terminus, the far shore is not as sheer as ours, and it is more heavily forested. The “smoking” trees, and yes, that is an eagle, encourage me, somehow, and I feel somewhere in this arm we might find a sheltered position. THE TONGASS, #120: As Philip Slagter and I slowly paddle down-fjord in Rudyerd Bay, we are paddling against an outgoing tide that will drop 18ft. You can clearly see how much is slowly being exposed. 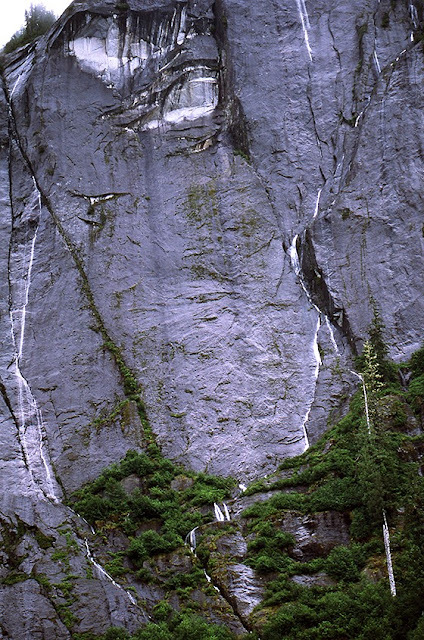 At the top of the dark rock band, the sheer walls are covered with lush mosses that cannot survive exposure to saltwater - that is the high tide mark. At the bottom of the dark rock band, seaweed is growing profusely, and soon a myriad of other plants, and some sea creatures will appear as the waterline continues to lower. We are almost to a point where Rudyerd Bay divides in to two arms. The shorter of those two arms is around this wall to the right. We are scouting every crevice of shoreline, hoping to find a campsite, and there certainly has not been one offered as yet, so we are hopeful things will change when we round the bend. THE TONGASS, #118: Our transport boat has just left Philip Slagter and I with our gear-stuffed kayaks in the huge fjord of Rudyerd Bay, part of Misty Fjords National Monument and the Tongass rainforest. It has rained hard all morning, but now it is intermittent, nonetheless the sheer rock walls stream with a myriad of waterfalls. Our boat put us off in mid-fjord, and while I take pictures and try to comprehend scale from my new point-of-view, Philip paddles closer to one side and up against the big walls. With him in the frame, it gives scale a new dimension. We are ants in this landscape. Even the trees growing out of cracks in the rock are HUGE! It is exciting to paddle beneath these towering, growth decorated faces as we proceed down the fjord toward a junction of two arms. Although we are managing our kayaks decently, never having done it before, as we paddle, we have two realizations. The first is just starting to materialize in this image. 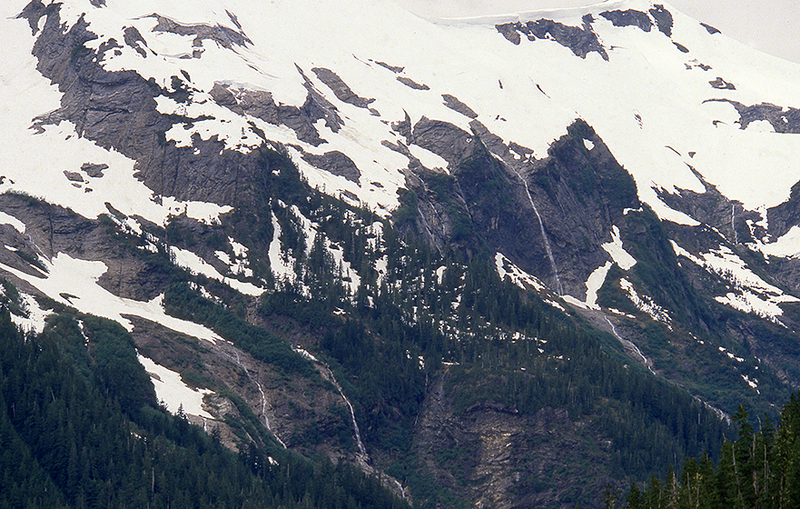 Note the banding along the shoreline at water level. The top of the dark band is high tide - twice a day. To the far left, you can also see seaweed growth being exposed as the tide drops. Starting right now, the tide is against us, outflowing and dropping..,18-FEET! In this fjord, that will be 18ft. straight down, exposing some very slippery walls. 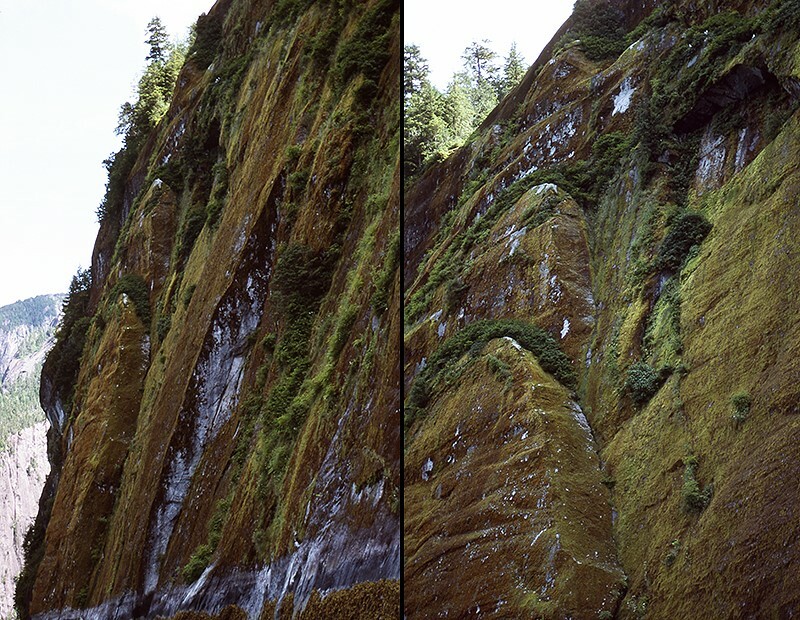 THE TONGASS, #117: My friend, and fellow artist, Philip Slagter, and I, come off of a cabin camping trip into Misty Fjords National Monument with a desire to be more mobile during our next outing. After a quick turn-around resupply in Ketchikan, we now have kayaks and have just been delivered by boat to a huge, steep-walled fjord called, Rudyerd Bay. 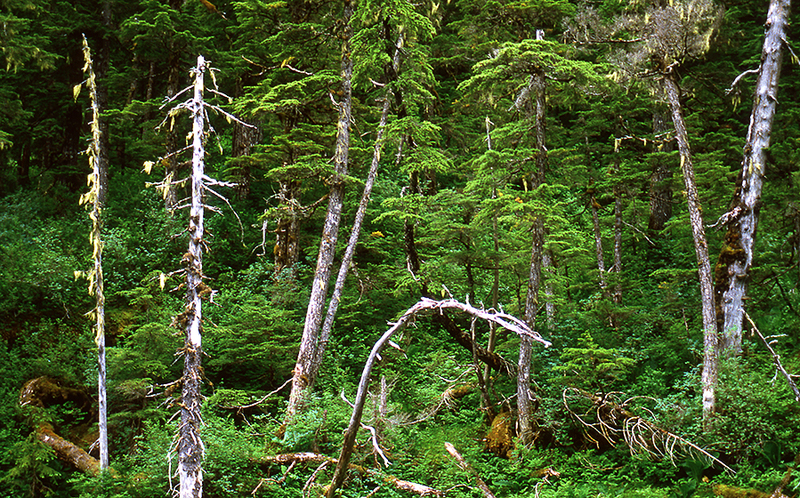 As these past days have just marked the beginning of our exploration of the Tongass rainforest, we have yet to camp on the ground and out in the weather (and bears), so this is our first experience. Oh yes! We have never been in kayaks before either! Rudyerd is huge, and a there is a bit of winding around after we enter the fjord, but eventually it straightens out for quite some distance, and about halfway down that stretch, we stop and disembark. If you have never done this, it is quite an amazing thing to do. The kayak is gear-packed to the limit, leaving barely enough room for you, and when the transport boat stops, you lower your kayak overboard, and clamor around to get in it. After some adjusting and double-checking that we have everything, the mothership departs AND WILL NOT REUTRN FOR FIVE DAYS. We are VERY on our own, and the first thing I notice is how much taller the world seems from my new water-level viewpoint. THE TONGASS, #116: Philip Slagter and I, regroup in Ketchikan after our cabin camp at Walker Lake, and prepare for our first kayak camping trip. 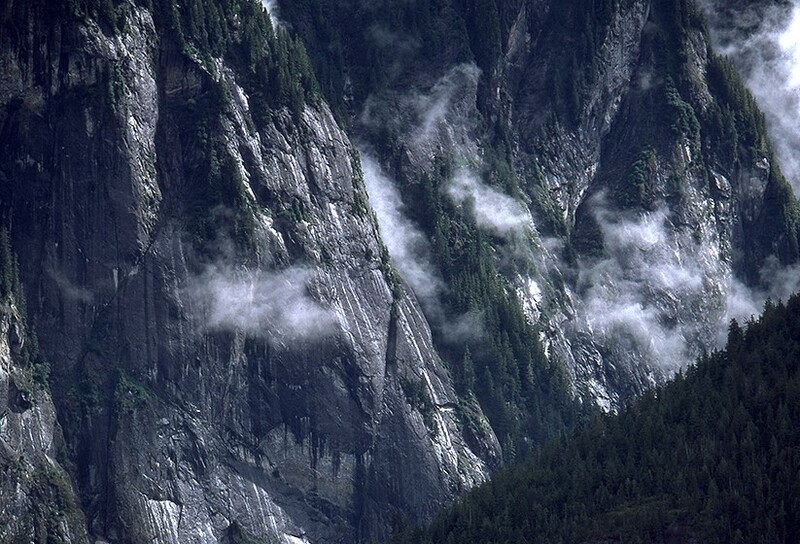 We plan to go into Rudyerd Bay, one of the many fjords in Misty Fjords National Monument. We have a boat operator that will drop us, and pick us up, and we have even found someone to loan us a rifle, so that we finally have some bear protection. It has been an unusually warm and sunny summer, as we experienced at Walker Lake, but today, as we head for Rudyerd Bay, Misty Fjords and the Tongass RAINFOREST are doing what they do best,..raining. Really raining! Philip and I wish it were otherwise, but we do have to get used to it, so we are off for another adventure to add to our learning curve. It is not especially windy, but it is raining hard, and does so for most of our boat trip. It seems to abate as we motor into the Behm Canal, and when we turn into Rudyerd Bay, it stops for a brief while. We are hopeful, and about halfway into the fjord bay, we have our boat pilot drop us. This is a drill I will repeat many times over the ensuing years, but the thrill of it never seems to change - the loaded kayaks go over the side, you squeeze down into the them through all of the gear packed around you, everybody confirms time and place of pick up, the mothercraft departs,..and you and your crew are sitting in a deepwater fjord wilderness, encapsulated in a skinny, funny looking boat with one big, weird paddle, and looking for a place to call home. It has not yet occurred to us that a fjord might not offer a lot of campsites,..especially one that has an 18ft. tidal swing twice-a-day. Oh well, there certainly is no going back now! THE TONGASS, #115: We climb in our flight path, leave the fjord, and emerge above the huge Behm Canal which we will follow home, so I can flightsee in the late light, and we can scout a location for our next adventure out. When I look back, I am amazed at where we have just been, and I realize how much snow there still is at high elevation. With days as warm as this one, it will not last much longer, but it is impressive to see the extent of the coverage. In this picture, where we were at Walker Lake is beneath the distant peaks in the upper right. Philip and I have found our cabin camp enlightening, and now we want to try another trip, but this time in kayaks with a tent,..time to learn how to manage camping with bears, in the rain. So, on our flight back, we briefly diverge to scout the location we plan to kayak, Rudyerd Bay. Like Walker Cove, it is another deep fjord cut running back into the heart of Misty Fjords National Monument and it is surrounded by very dramatic summits and sheer walls down to the waterline. Philip and I both agree that it looks like it will be an exciting thing to do, so now it is time to find a hotel, eat a few restaurant meals, and re-supply ourselves. We have already contacted someone who will rent us kayaks, and we have a boat operator that will take us to Rudyerd Bay, drop us off and, hopefully, pick us up. 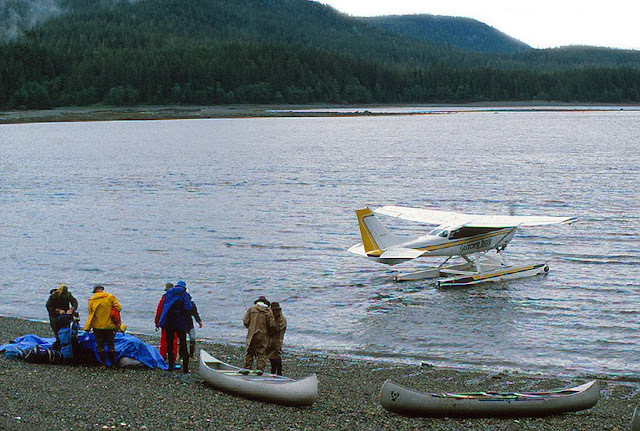 THE TONGASS, #114: The warmth of the day begins to fade as evening approaches, so Philip and I load our gear into the plane and and say goodbye to Walker Lake. For the last few days we have been in a relatively contained POV, as there were few places we could go aside from the immediate perimeter of the lake. Once the plane lifts off, however, I am immediately reminded of what an amazing platform it is to be in the air. It brings us close-up and eye-level with things that we have been viewing at a distance, and that were well above us. Basins, waterfalls, and the sheer, sheer vertical walls pass close by our wings as we head down-fjord and back to Ketchikan. The late light casts a glow on everything at the end of a very sunny day. 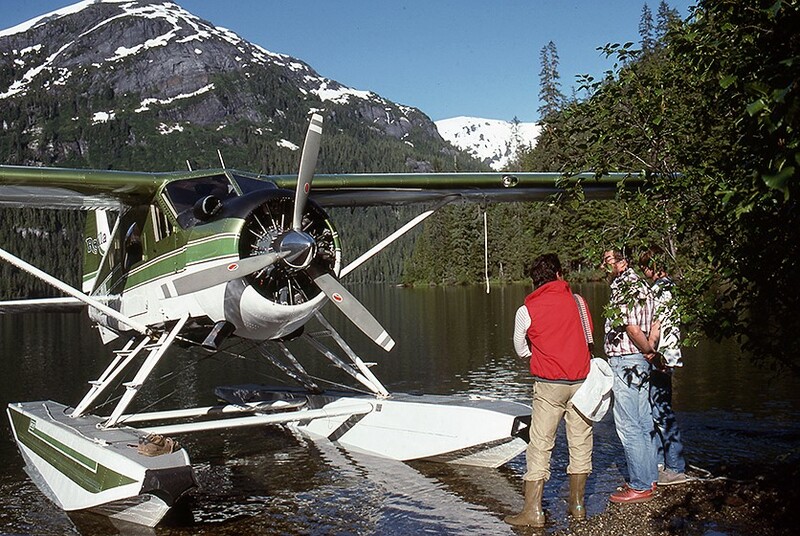 THE TONGASS, #113: It is such a beautiful day to fly that the pilot has brought his son along, and here you see them talking to Philip, and taking in the late light and warmth of the day at Walker Lake. Phil and I have been a bit bored as our movement in the landscape has been very limited, but at the moment, we all appreciate the clear, temperate evening, and no one is in a hurry to be anyplace. When we tell our pilot about our experience, and our frustration with being limited in where we could go, he suggests if we try another cabin, we use ones used by goat hunters, because they are located on high altitude lakes, and offer access to granite ridges and summits, so we could move about more easily. He also thinks we should go kayak camping in these fjords, as that will give us a lot more mobility, as well. Since this has been our first camping in the Tongass, and we have not died, his suggestions are well taken. Phil and I also agree it would be nice to have a rifle, because it would make us feel safer, and more willing to wander in the woods. THE TONGASS, #112: Our morning dawns, bright, clear, and hot, and we do not expect our plane until the afternoon, so I go out and shoot for awhile. Once again, I am eventually overwhelmed by insects, so Phil and I get back in the boat and return to the middle of the lake. With no need to fish for dinner, we just float around killing time and getting stupid. Lunch brings us back to the cabin, and now it is time to pack. About the time we finish with our gear, and replace some of the firewood we used, it is mid-afternoon. You can hear it, long before you can see it,..a low droning noise that seems to be echoing from the other end of the fjord. As it grows steadily louder, it is clear that it is our pilot, coming for the pick-up. Many minutes pass before we can actually see the plane, and when we do, it is just a speck against the surrounding walls, reminding us once again, of the scale of this landscape. Eventually the plane comes directly over the lake and cabin, and we acknowledge each other with a wave. A nice smooth U-turn, a perfect landing on glassy water,..our ride has arrived. We are about to leave Walker Lake and return to Ketchikan. 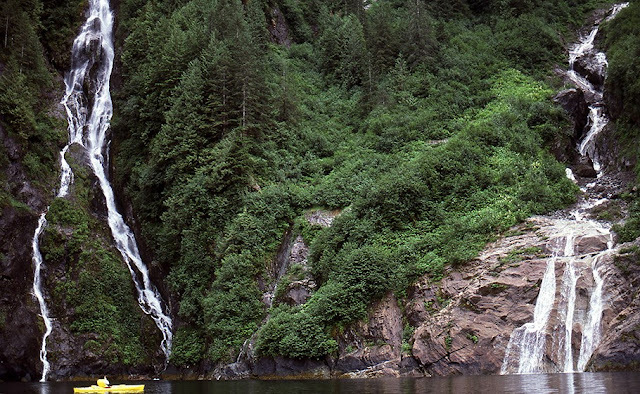 THE TONGASS, #111: Our day of fishing, and avoiding insects is actually boring, because we are so limited in what we can do. At least it is warm and sunny. We have explored the lake perimeter, gone ashore in a few places, getting nowhere, and now we are resolved to just await our plane pick-up, which, weather permitting, is supposed to be the next day. 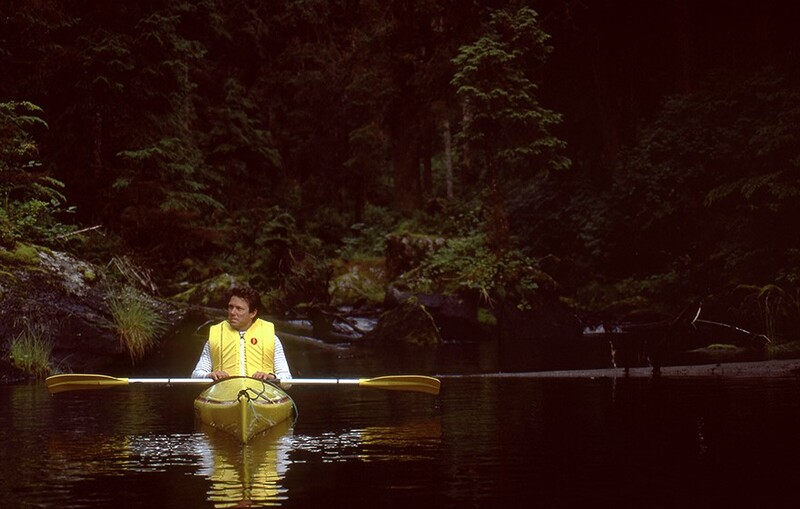 As evening approaches, Philip and I row back ashore, and swat our way back to the cabin. The cabin has cooled down a bit, and is always welcome relief from attacking bugs, so we have a nice slow meal, consume our remaining alcohol supplies, take a brief walk in the very bright moonlight, and sleep. From the look of the skies at this moment, the plane WILL be here tomorrow. THE TONGASS, #110: After awhile, we have enough trout for a great evening meal, and there is little else to do, but there is no chance we are going to return to shore so the bugs can feast on us, and the cabin is way too hot to sit in. 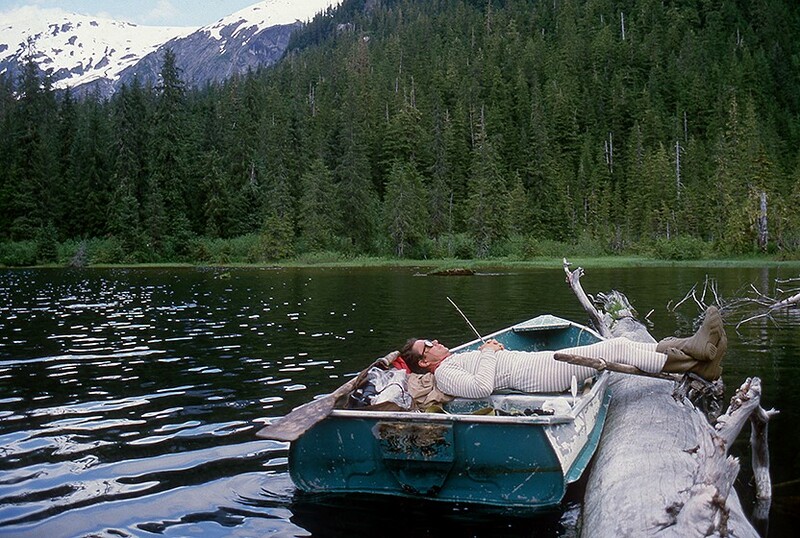 Philip decides the best solution is to take a nap, so we pull alongside a partially submerged tree trunk and settle in for a snooze. Eventually, this vision of our Alaskan wilderness adventure was too humorous, not to make a picture. So, here is to you Patagonia! 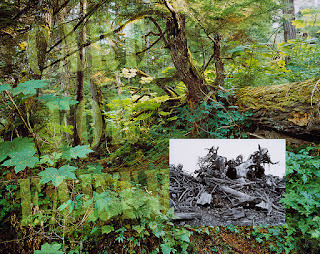 Thank you for supporting my Tongass project and giving us many layers of your new clothing system. I hope you feel your capilene base-layer is well modeled here. In years since, Patagonia has told me my pictures are not “fun-hog” enough to use in their advertising, but I guess that depends on what you consider your level of “fun” is. Philip and I are having fun, and this picture is certainly “fun-ny." THE TONGASS, #109: It is a lazy, HOT day at Walker Lake, and Philip Slagter and I have fled the insects and the hot cabin, taking the boat to the middle of the lake where the bug population declines significantly. 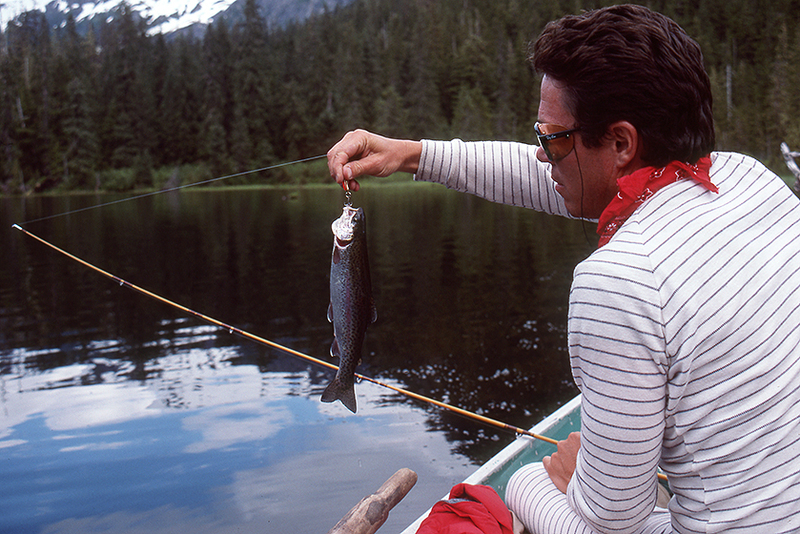 There is little to do except try to avoid being bitten, and perhaps catch a few trout for dinner, which we do. Out on the lake with no trees immediately around us, we have a more expansive view as well, which is nice, because the fjord walls that surround us are dramatically steep, and streaming with waterfalls. It is also clear from the exploring we have done on previous days, that we are VERY limited in our ability to get around in this terrain. 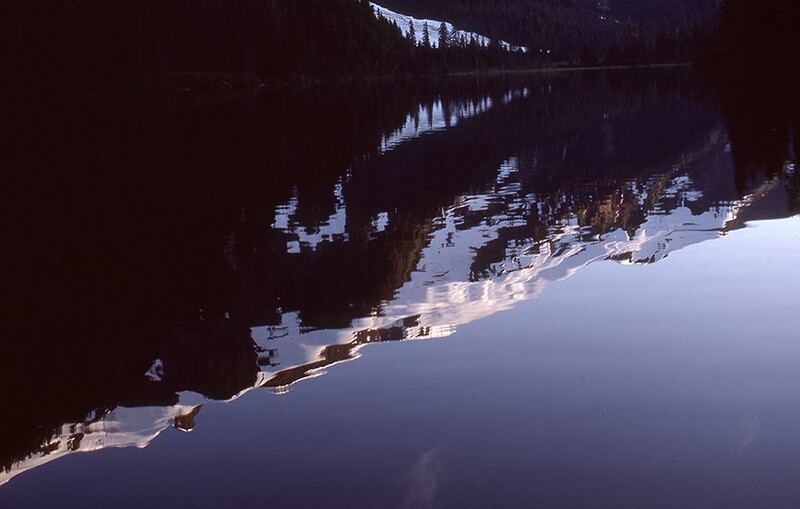 Besides the immediate perimeter of the lake, and the lake, itself, there are not really any other places for us to go. Perhaps we could bushwhack, but as we are NOT armed, and there are definitely bear out there, we are not doing that. So, we while away our time swatting bugs and collecting dinner. 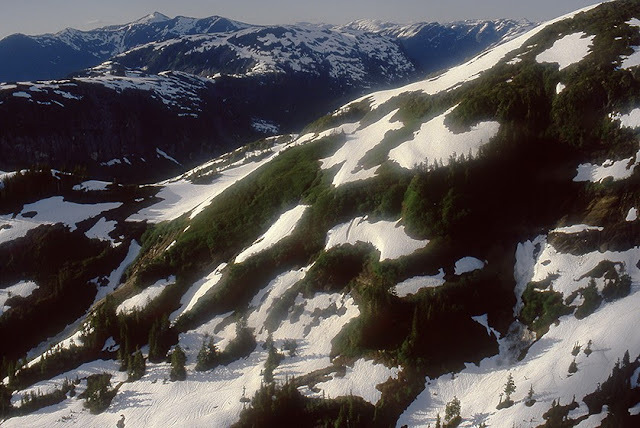 We are in a learning curve about the Tongass rainforest, and this is the first time we have camped, so we can begin to see what our limits might be, AND it does seem a good idea to carry a weapon in the future. 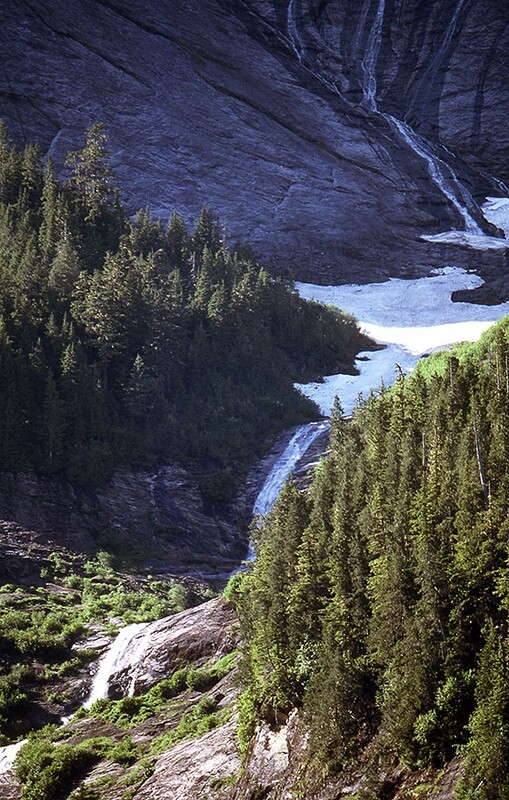 THE TONGASS, #108: The day is hot and clear. The cabin in which Philip Slagter and I are camped is also very hot. Outside, the insects are in a frenzy, and we are their target. So, we are left with little choice. Only in the middle of the lake can we relax without being attacked, and besides, Philip wants to go fishing. Back into the boat, it is a great relief to row away from shore because with each passing stroke, the bugs decline in number. In the middle of the lake we are nearly bug-free, so Philip settles into the pursuit of our dinner,..trout! He has great success as you can see, and we are finally comfortable, except for the unusual heat. The Tongass is usually cold and rainy, but this summer it has been surprisingly warm, and on this day, it is flat-out blazing. If you wondering about Philip’s prison stripes, what you see is a “first” layer of Patagonia’s new clothing system. He sports a capilene top and long-john bottoms. 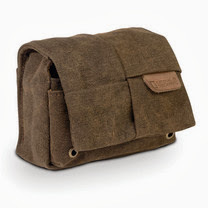 This material Patagonia has introduced acts like wool, keeping you warm, even when it is wet, BUT it is much lighter than wool. We have been wearing this capilene layer beneath our rain gear, but it SO hot today, being in our rain gear is intolerable, so we have both stripped down to just the capilene. Given the conditions, this is the perfect wardrobe. We are comfortable and not overheated, and the full clothing layer protects us from the few bugs that do find their way out to us in the lake. Fish-on! 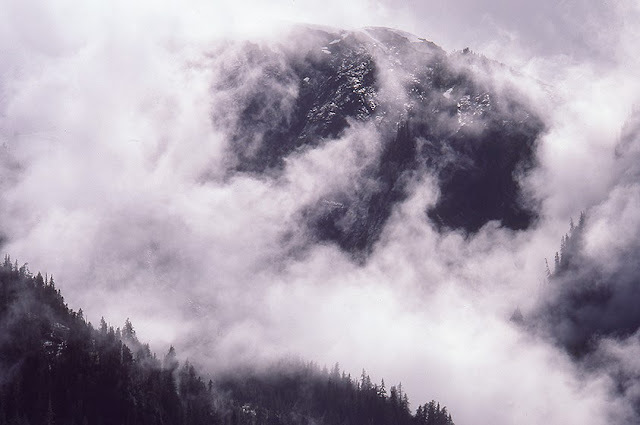 THE TONGASS, #107: During the night, the weather dissipates completely, and Philip Slagter and I arise to a warm, sunny day with just a few passing clouds in the sky. I eat quickly and then go out for a camera stroll that brings me to a little bonsai garden area of Walker Lake. 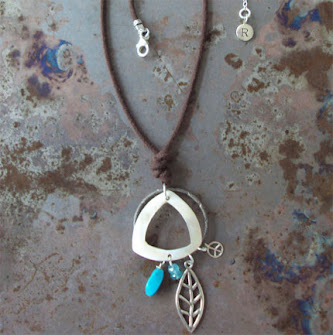 There are tiny, stunted trees, and sloughs of crystal blue water, sprouting lily pads. 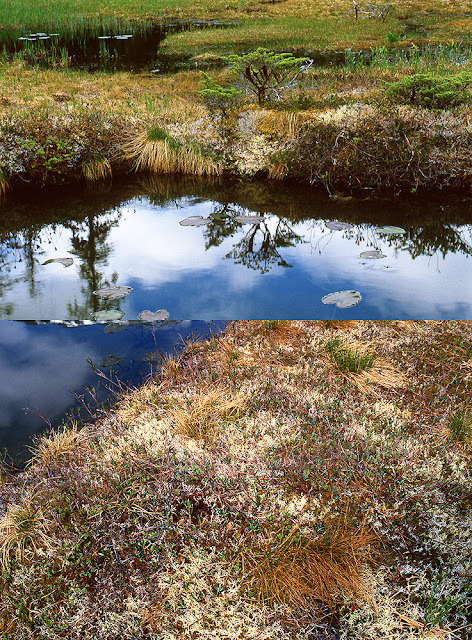 There is also a psychedelic meadow grass/tundra that comes in every color of the rainbow. Of course, I feel impelled to get down on my hands and knees and graze. Unfortunately, the lovely day is warming quickly and there are others out here who are grazing also,..mosquitoes and white socks flies are grazing viciously on me. I do mean viciously,..so much so that I am forced to retreat to the cabin as I cannot work, I am being so attacked. When I report this news to Philip, we agree that it is far to boring and hot to stay in the cabin, so our hope is to retreat to the middle of the lake (almost no insects), and spend the day fishing. 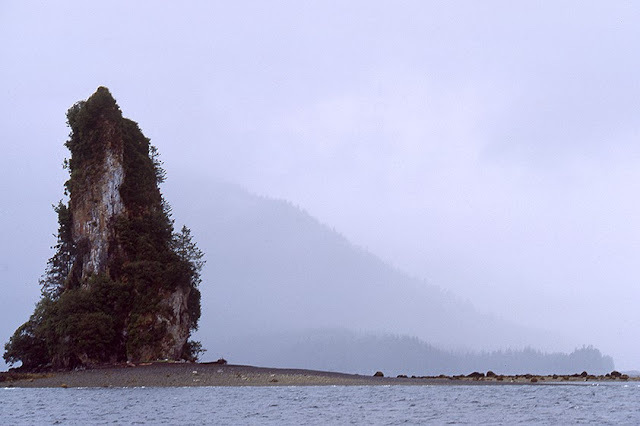 THE TONGASS, #106: As Philip Slagter and I float around Walker Lake in MIsty Fjords National Monument, the very rainy weather we have been experiencing seems to finally be breaking off. We can see occasional patches of blue sky, and many of the surrounding summits are now more visible because the clouds are lifting. It has actually snowed at the highest elevations. At lake level, Philip and I are quite comfortable though, and Philip is excited to see trout lurking about, so we plan to fish in the morning. At the moment, however, evening is descending upon us and we decide to head back to the cabin for food and libations. 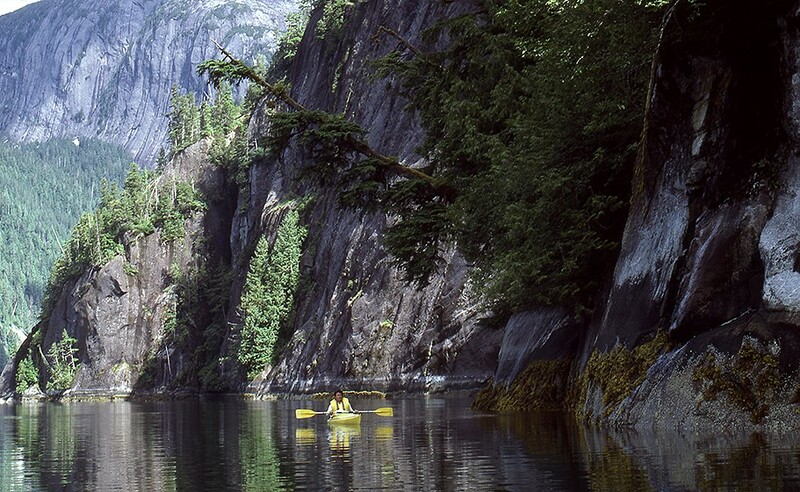 THE TONGASS, #105: Paddling around in the boat that comes with our rental cabin, Philip Slagter in Misty Fjords National Monument. 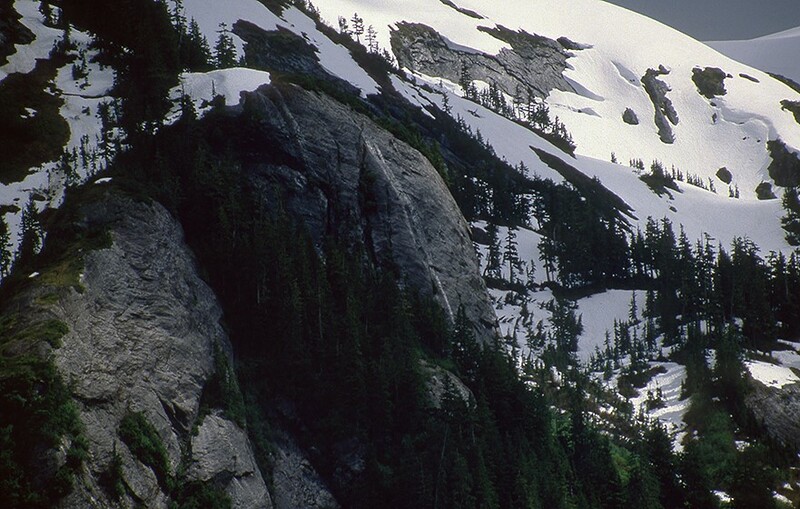 What we discover is that except for a few moss meadows and rocky points, the forest is impenetrable. In the few places where we can actually reach a rock wall, they are so abruptly steep that they are unscalable. It is clear to us that our domain is a very contained area, and we will only be able to wander just so far from our cabin. Nonetheless, our surroundings are quite beautiful and dramatic, so we resign ourselves to floating in the middle of the lake, and watching the world go by. THE TONGASS, #103: Walker Lake is larger than it looks, and now that Philip and I are out in the available boat, there is much shoreline to explore. To start things off and adjust our POV, we simply row into the middle and drift for awhile. The rain lets up, and the clouds lift a bit, so Philip and I just float around for awhile, taking in the view of big walls and waterfalls. It is a HUGE fjord basin, and we are only just beginning to grasp that. Although we have not brought our fishing rods with us from the cabin, we can see fish, so we plan to have trout tomorrow. At the moment, the day is wearing on and there is still much to investigate. We begin a tour around the entire shore, trying to cypher what we discover, and hoping to find access to rock that we might scale to get higher. It does seem the weather is breaking, and it has become a bit warmer and a lot more humid. The bugs love it! Offshore, at a distance, they seem to leave us relatively alone, but as we approach the edge of the forest, their numbers become exponential. 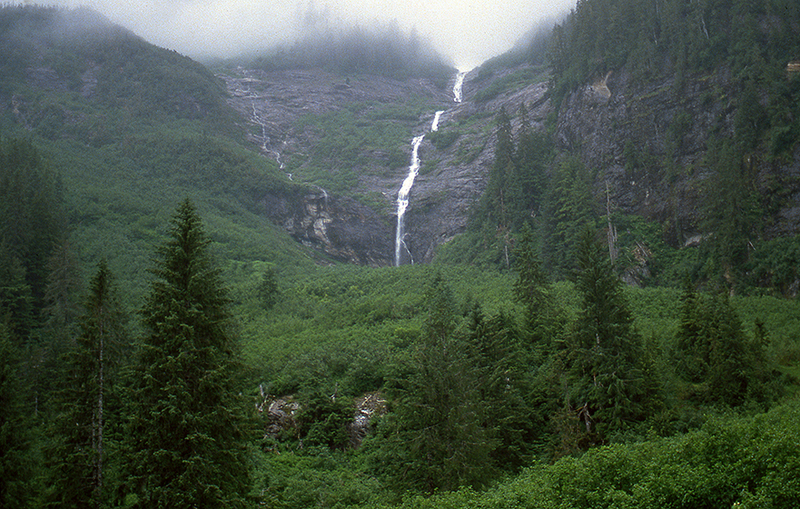 THE TONGASS, #102: The rainy, soggy day is actually quite amazing, everything seems so lush, so verdant. This is the first time that either Philip or I have camped in a rainforest, so we are just soaking it in (LOL)! Our raingear and knee-high boots keep us both in an insulated, humid-warmth system that is very comfortable, and the tall boots make us child-like because we can slog anywhere we choose. At one point on the return to the cabin, we come upon a very squishy, moss meadow, interesting enough that we both got down on our hands and knees to examine it more closely. Once back at the cabin, we have some snacks, but remain restless with cabin fever, so out we go again, this time headed for the boat. The rain has let up a bit, and because of our walk, we realize the limits of overland travel, so exploring Walker Lake with the boat seems a good idea. THE TONGASS, #101: Full raingear and knee-high rubber boots are clothes most southeast Alaskans wear a good bit of the time, today being a perfect example for their need. It is pouring, but Philip Slagter and I, are warm and dry inside our clothing layers. Patagonia recently started marketing new tech clothing, and before coming into Southeast, I approached them for field support. They were VERY generous, giving me full raingear, layers of fleece tops and bottoms, and their newest material to replace wool or silk long-johns, Capilene, a thin, but warm synthetic, that like wool, could be worn wet. As a consequence, Philip and I are styling some trick clothing, and we are VERY comfortable in it. We wander for about two hours, and everything is squishy, boggy, buggy, and saturated. We finally go as far as we dare without weapons, halting at the dense bush beyond the lakeshore, at the foot of the surrounding granite domes. 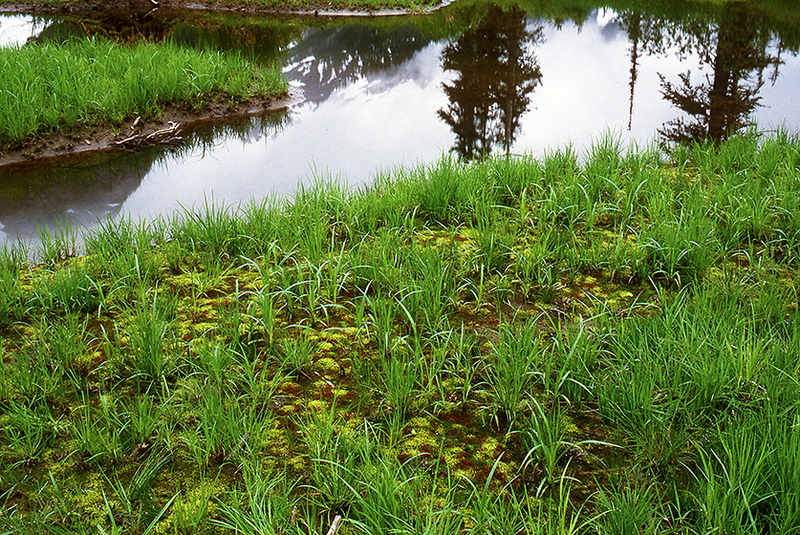 There is no way we are wading into this without suitable protection, so we linger for a while, marveling at the lushness of it all, and then meander back to the cabin. 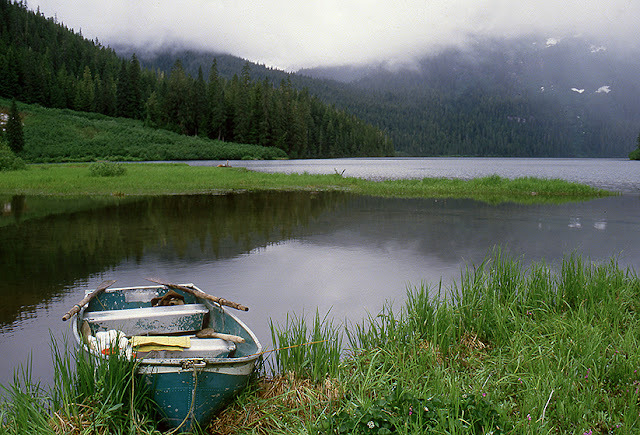 THE TONGASS, #100: There is a boat available to us at Walker Lake in Misty Fjords National Monument, and the nearby cabin is a well maintained and in good condition. Philip and I realize almost immediately how important that is because it begins to pour, and biting insects are everywhere. We immediately scoop up our gear and hustle it into the cabin, where we find a great working stove, a number of bed racks, a table, and MOST IMPORTANTLY, undamaged screens on all the windows. 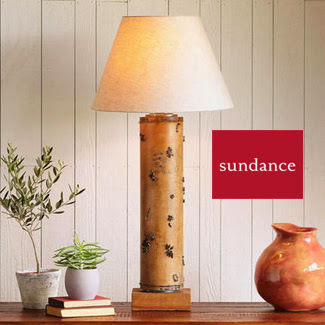 Inside, there are few bugs, so once we purge them, we spread out our stuff and settle in. The rain continues unabated, so we cook, eat, and drink, but inevitably “cabin fever” becomes manifest, so we don our rain gear and mosquito head nets, and go out for our first walk-about the neighborhood.